Rev. Daniel (Danny) Couch and Samantha (Sammy) Sadel, representing Bridging Cultures, visited Ecuador from November 18 to November 24. Danny is a pastor at Central Christian Church in Weatherford, Texas, and Sammy is a member of the same church. Central Christian Church is one of eight churches in Texas and Arkansas that support Bridging Cultures. Their focus at the moment is partnering with the citizens of Pusir Grande in the Chota Valley of Ecuador to exchange cultural experiences in order to increase understanding between vastly different cultures. There is also a component of aid. The purpose of this week's trip was to plan and prepare for two groups Bridging Cultures will be sending to Pusir Grande in March, during spring vacation in the US. 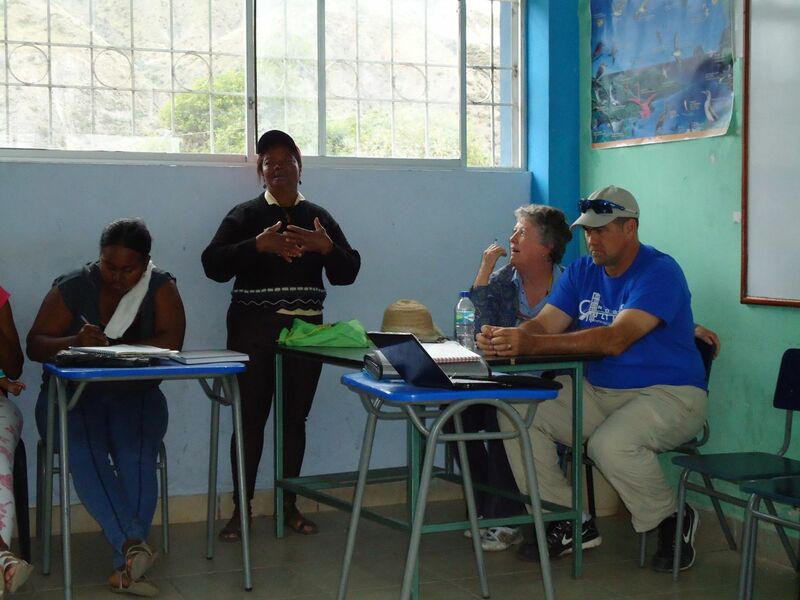 They have partnered with FEDICE and are receiving valuable assistance and guidance as to how to organize and work with villages in Ecuador toward goals of self-sufficiency and alleviating poverty. FEDICE, for its part, is very gratified to be able to help serve an Ecuadorean population with which they have not worked with in the past. Marilyn Cooper and Glenn Hebert, volunteers with FEDICE, went to meet Danny and Sammy on Monday night at the airport in Quito and drive them to their home to spend the night in Otavalo. Along with their "family" of Brayan, Isabel, and Victoria, they left the house much earlier than necessary to for Sammy and Danny's 7:35 pm arrival. The idea was to treat themselves to a hamburger or hot dog at Johnny Rockets in the new Quito airport. The problem was that it had been raining for two days in Otavalo. Ten minutes from the house, they found themselves stuck (no, stopped) in traffic, only blocks from leaving the city limits. Since the government had been widening the highway for about 16 kilometers south of Otavalo, they naturally assumed that the stoppage was because of machines on the highway and that traffic would be flowing again soon. There was machinery on the highway alright, but it was not due to any road building. Because of all the rain, a landslide (deslave, or derrumba) had occurred just south of Otavalo. They found this out from people who were walking into town from busses that had been stopped on the other side of the deslave. Marilyn, et al, could have turned around, but there was no point. There's only one good way to get to the Quito airport from Otavalo. Might as well wait and see if the highway opened in time. When it was getting close to the time Blanca and Luis would have to leave their house if they were going to pick up Sammy and Danny, Glenn suggested Marilyn call Blanca and put her on alert. (As it turned out, Blanca was not in Quito and couldn't have gone to the airport anyhow. She would have had to ask Lisa to do it.) Fortunately, fifteen minutes later the traffic began to move and the alert was called off. There was a lot of traffic, but Glenn still thought they'd make it in time. He was counting on customs taking a while. When they found Danny and Sammy, they were leisurely eating a snack (not a hot dog) and had been waiting for about 20 minutes. So much for Glenn's theory. Because they wouldn't get back home until after 10:00 pm (assuming no more deslaves), Glenn and Marilyn decided to wait and eat when they got home. So much for hot dogs or hamburgers from Johnny Rockets. So much for mixing pleasure with business! Following breakfast on Tuesday morning, Marilyn took Danny and Sammy to visit two of the preschools where she teaches English for FEDICE. Marilyn normally teaches a total of four classes in three different preschools on Tuesdays and Thursday. Sammy in particular loved this activity. Though she teaches high school English, she also loves to be around little children. She said that she could have stayed there all day! But Marilyn was also determined to show them a little of the tourism of Otavalo. As soon as they returned, they hiked over to Peguche Falls from Marilyn and Glenn's house, despite the fact that members of the FEDICE team had already arrived for a scheduled lunch at the house. Glenn was assigned to entertain those who chose not to walk to the falls. After lunch with Blanca Puma, Hugo Pacheco, Lisa Renz, and Luis Jara Roman, all from FEDICE, everyone drove to Pusir Grande in the Chota Valley. This community is very poor. It doesn't receive much from the various government entities. It is almost entirely agricultural. But, with the aid of Bridging Cultures and FEDICE, the community is transforming itself from a collection of people who didn't have much hope and didn't really work with each other, to an organized, vibrant community that is learning how to better provide for themselves and that is developing greater self-esteem and pride in their work. With the blessing of Bridging Cultures, and their contribution of funds, FEDICE organized a group of 47 women in the community to create and implement a money-making project. Each participant was given $200, to be reimbursed to FEDICE at the end of one year. If everything goes well, and FEDICE is reimbursed after one year, each participant will be eligible to receive larger amounts of money in order to expand or implement new projects. Besides, the projects, the group has also been taught how to save as a cooperative unit. This will aid them when future emergencies arise, be it a sick member, a dead animal that needs to be replaced, etc. This process developed by FEDICE has been very successful in other communities. 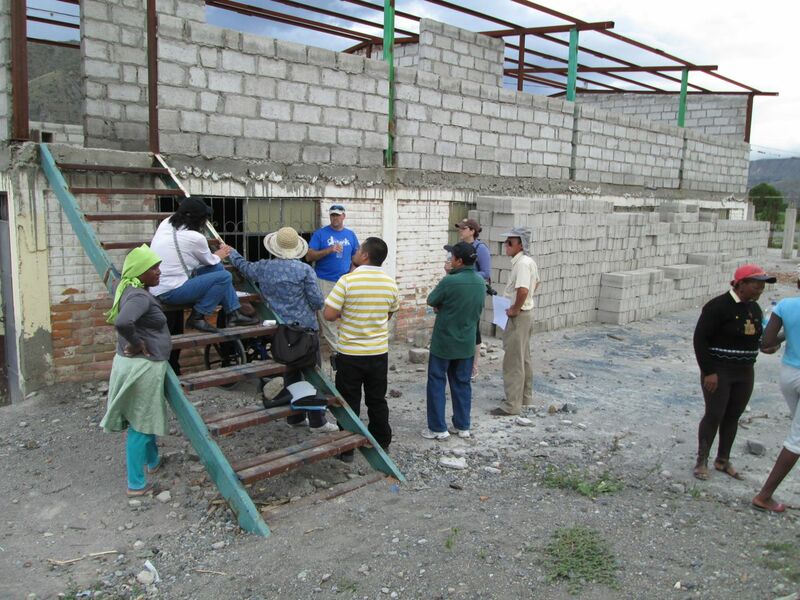 In fact, one community now has a fund of $70,000 and FEDICE therefore no longer needs to work with them. The group of women in Pusir meets with a representative of FEDICE, usually Hugo Pacheco, once a month. This month the meeting was scheduled to coincide with Danny and Sammy's visit. Many of the women explained their projects and how they were making, and expected to make, differences in their lives. Lisa Renz has expertise in making perfumes, a meat enhancer, and a cream used by mechanics and others to cleanse their hands of grease. She offered to teach the group how to make and sell these things. They enthusiastically accepted the offer. When it was Danny's turn to speak, he told the group about a group of women in his own church. The women in Texas have heard about the women in Pusir and have decided to organize along the same lines. He pointed out that the group of women in Pusir should be extremely proud of themselves because they have inspired a like-minded group in the US. After the meeting, Danny, Sammy, Blanca, Lisa, Hugo, and Luis went to a nearby hotel because they would have more meetings with the citizens of Pusir on Wednesday morning. 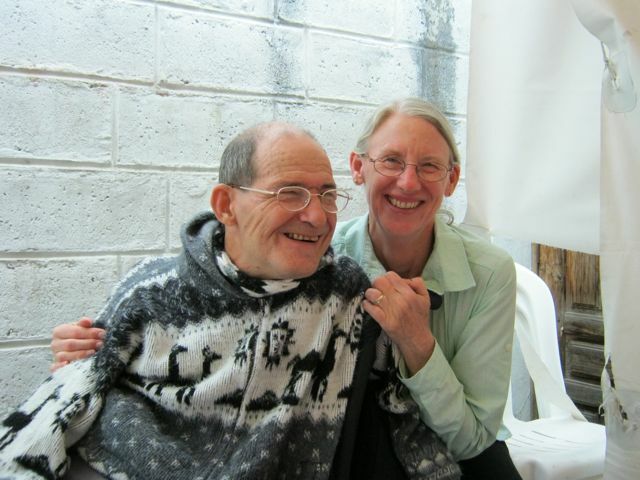 Marilyn and Glenn drove back to Otavalo, dropping off Cosme Yepéz at his home in Ibarra. Cosme is a FEDICE board member and a civil engineer. He had come to share his expertise on a building that Bridging Cultures is helping to build in Pusir Grande. It will function as a place to teach shop and computer science. On Wednesday afternoon everyone met again at the home of Marilyn and Glenn. The purpose of this meeting was for FEDICE Board President Sebastian Caiza to share the philosophy of FEDICE, and also provide more in-depth information about the organization. When Sebastian finished his presentation, the floor was thrown open for an exchange of ideas. When Sammy learned that Sebastian's community has a summer camp for kids, she immediately began thinking about how that could happen in Pusir Grande. She teaches at an international boarding school and knows the value of cultural exchange. A great idea that Sammy had was to bring the Pusir Grande children to meet the children of San Rafael/Tocagón (where Sebastian lives) and/or vice versa. It was a very productive meeting. Besides the meetings in Pusir on Wednesday, there was another reason for Sammy and Danny to stay overnight. 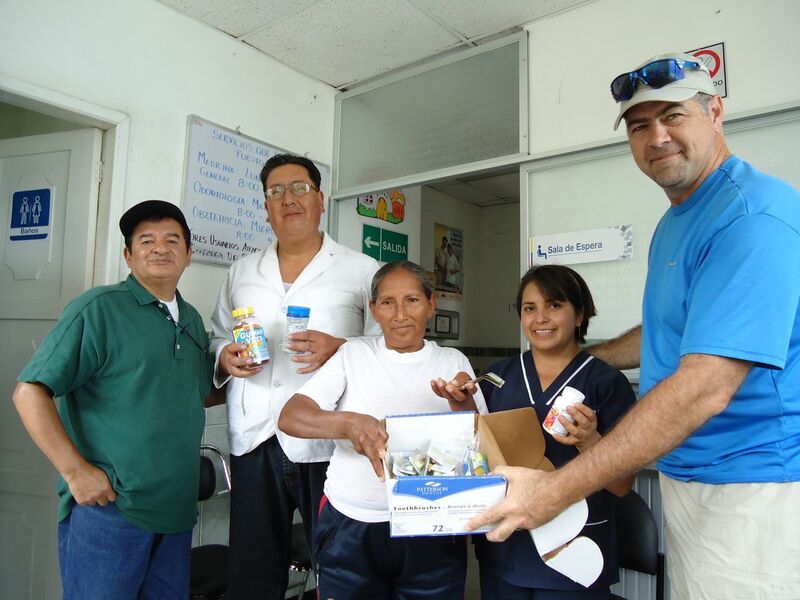 They delivered medical supplies donated by Bridging Cultures to the medical center in Pusir Grande. These consisted of medicines and vitamins for the children. On Wednesday afternoon everyone met again at the home of Marilyn and Glenn. The purpose of this meeting was for FEDICE Board President Sebastian Caiza to share the philosophy of FEDICE, and also provide more in-depth information about the organization. When Sebastian finished his presentation, the floor was thrown open for an exchange of ideas. When Sammy learned that Sebastian's community has a summer camp for kids, she immediately began thinking about how this could happen in Pusir Grande. She teaches at an international boarding school and knows the value of cultural exchange. A great idea that Sammy had was to bring the Pusir Grande children to meet the children of San Rafael/Tocagón (where Sebastian lives) and/or vice versa. It was a very productive meeting. Danny and Sammy had more meetings with FEDICE on Thursday. After that, they did a little sight seeing on Friday and Saturday before heading back home on Sunday. All of at FEDICE wish them well and trust that their visit was productive. My wife and I are coming to Ecuador from September 12 until October 28, 2014 and will be working on our Spanish, mainly in Quito. We are members of Irvine United Congregational Church in Irvine, CA. My task last year was to "certify" IUCC as a GM Congregation which happened last May. We have a week of free time and sometime after 10-15 and would be happy to offer our services, if you could use them. My wife is a retired school teacher (kindergarten), I am a retired Episcopal priest and psychotherapist. We both work in the prison teaching inmates English and we have no problem doing anything that you would deem helpful. Your project sounds very interesting. Sounds good. If you end up not helping FEDICE, please be sure to remind us closer to the time you’ll be here. If you do end up doing something for FEDICE, we’ll know when you’re coming. Such inspiration happenings in Ecuador! Thanks for sharing what God is doing in your midst. You're right--we can learn from the examples of how poor communities are coming together to make a huge difference in people's lives.